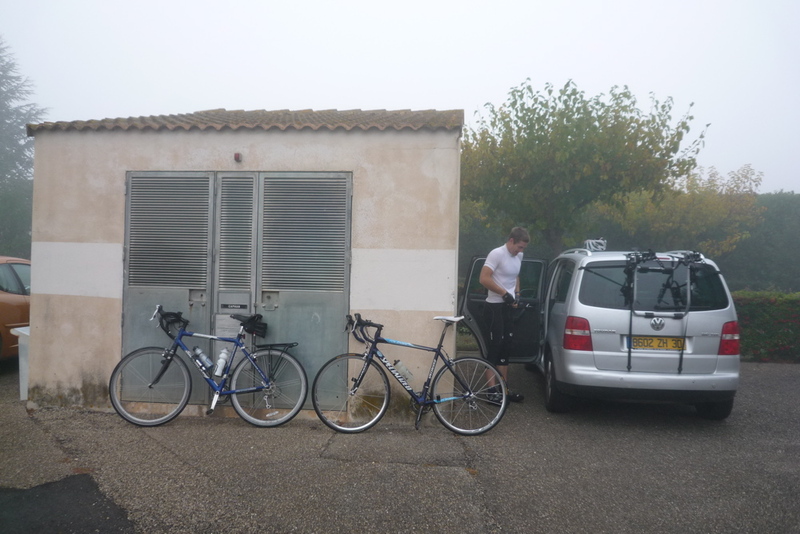 After 9 months of talking about doing another ride (here’s our first), John and I finally got our collective acts together and drove over the ‘border’ to Provence. John, like most people I guess, has a car and I realized again how handy one of these machines would be for cycling (but also ironic, I suppose). Instead of riding to the station, hopping on a train, more riding to the start of the ride, then the ride, then the whole train process all over again…if you have wheels you just jump in and drive. How novel! So, even though it’s a little insane, I’ve decided I need to have a car to support my cycling habit. More on that when I actually have money. The last week has been gorgeous here – over 20 most days, until the weekend, of course. Here’s what the beginning looked like. It felt even worse, since it was 10 degrees and raining a bit. 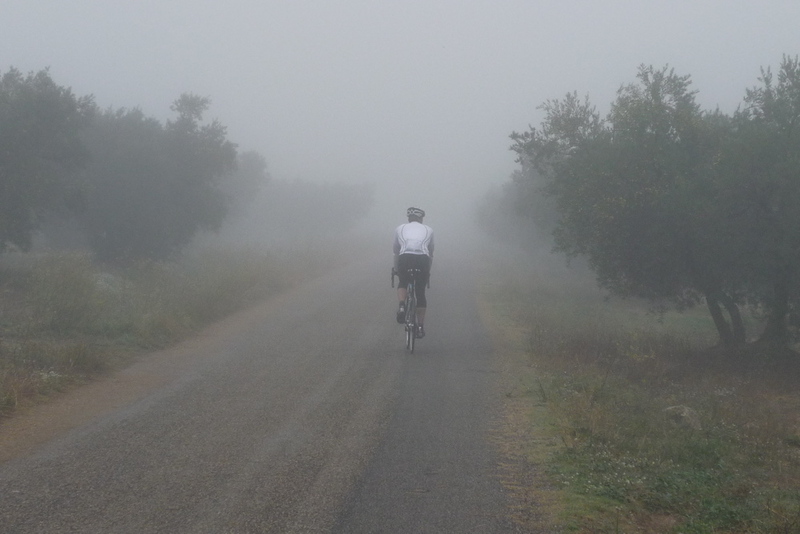 The fog stayed with us through the endless olive groves of The Alpilles. 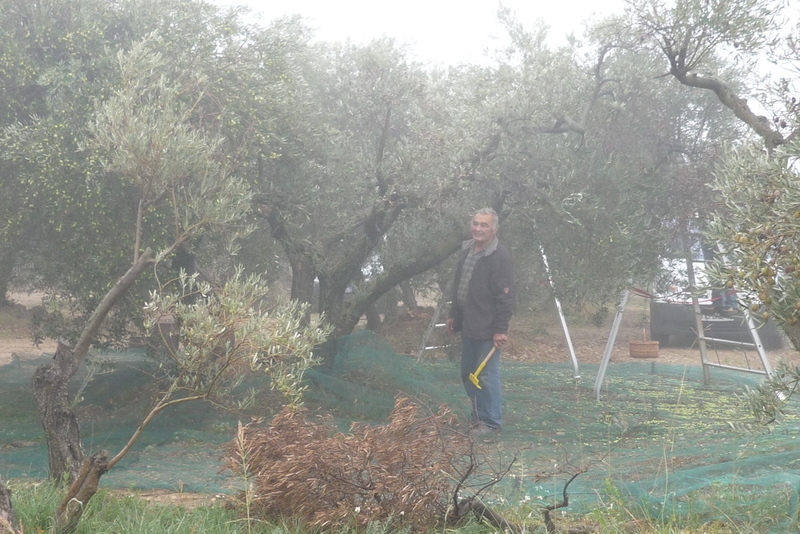 The yellow thing in this man’s hands is a small rake for harvesting olives by hand. 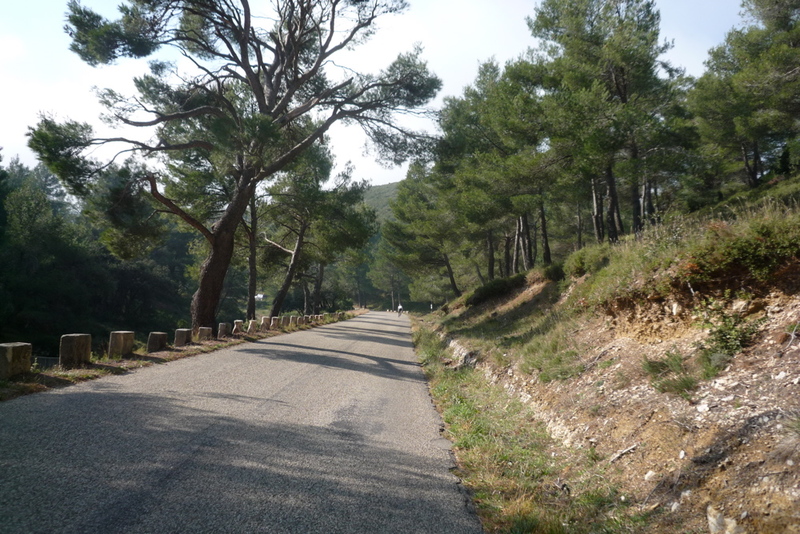 John sparked up a conversation with him and discovered that one tree can produce up to 100 kg of olives. How many pizzas does that make…? 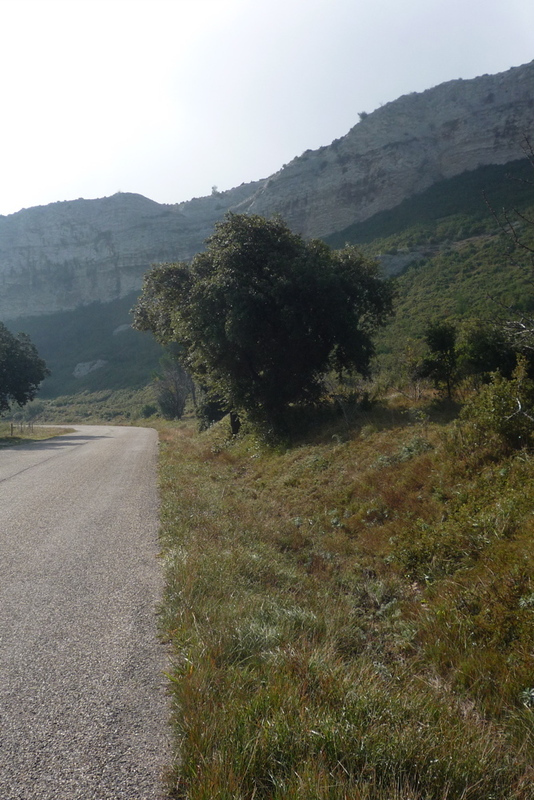 This little area in and around the mountain chain is well known for its quality olives, by the way. Here ‘s a little article on olives, olive oil and the stuff that comes from this guy’s tree. In fact, pretty much the only way to get rid of the stuff was to climb out of it, as we had to do a few times on the ride. 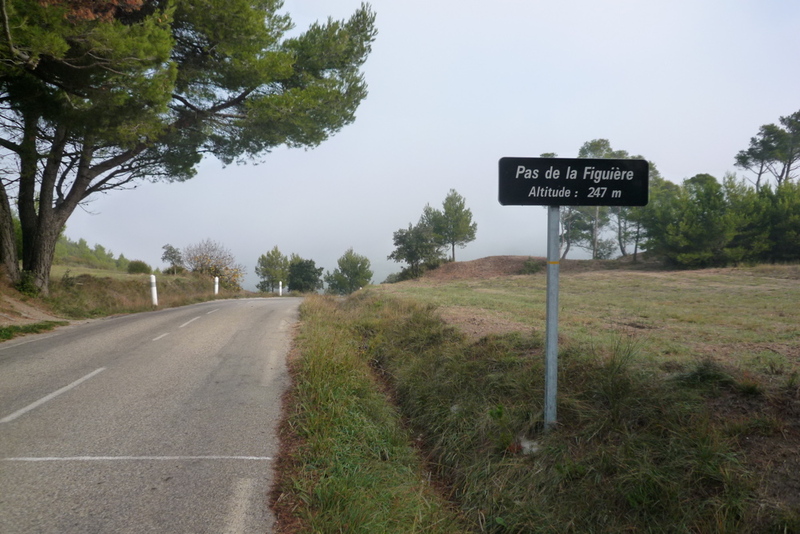 Next, a sign that confirms the French have a sense of humor – a ‘mountain pass’ of 247 meters. 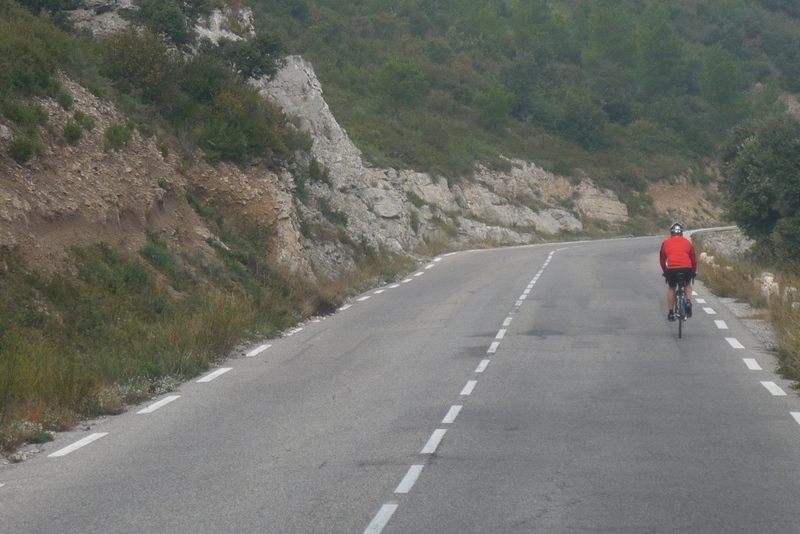 Shortly after conquering this pass we descended into Eygalières, a small, pretty village and a good place to stop for a pain au raisin. 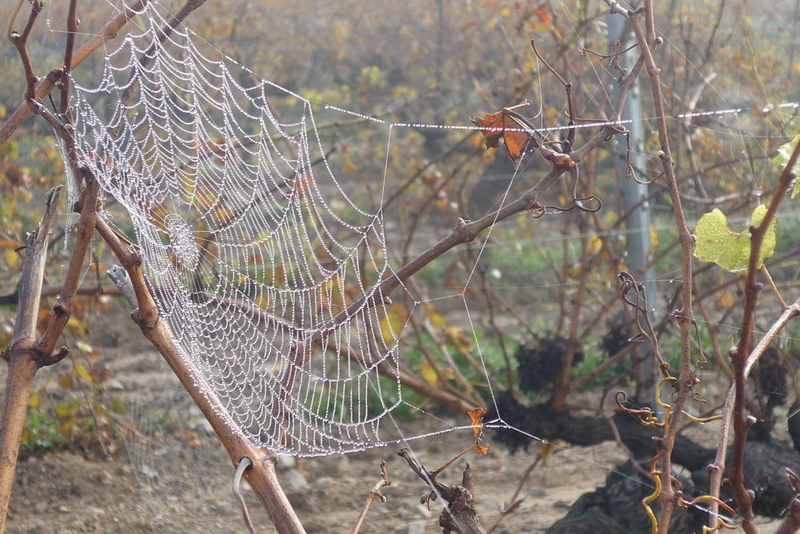 On the way out I spotted a vineyard with tons of dew-drenched spider webs glistening in the sun (we were still up high enough for sun). 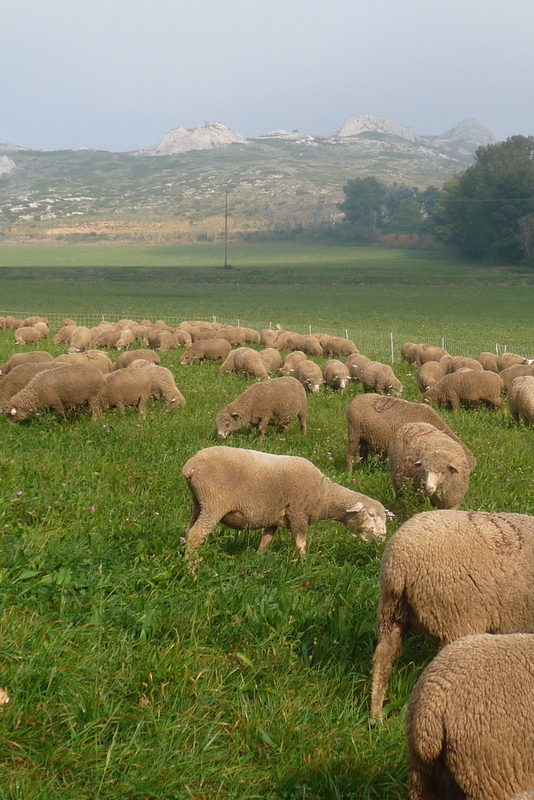 …to a pretty sheep-filled valley. 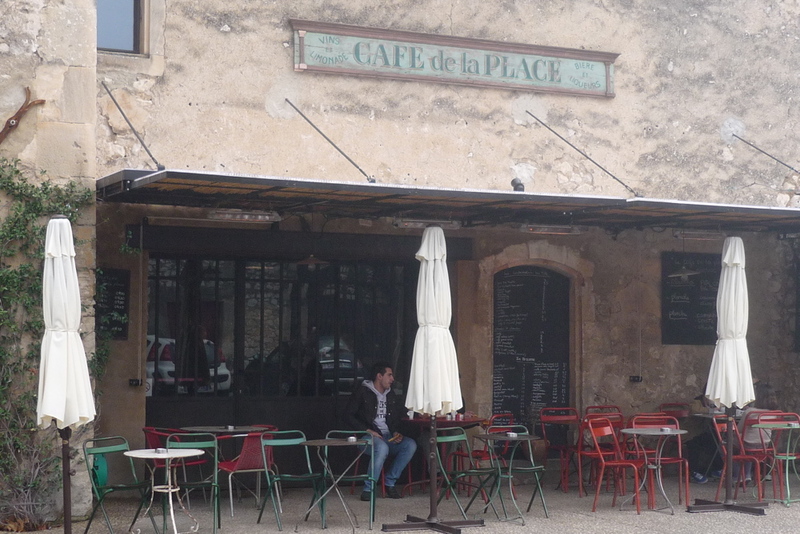 Next, a quick stop in the (seemingly) well-heeled village of Maussane. 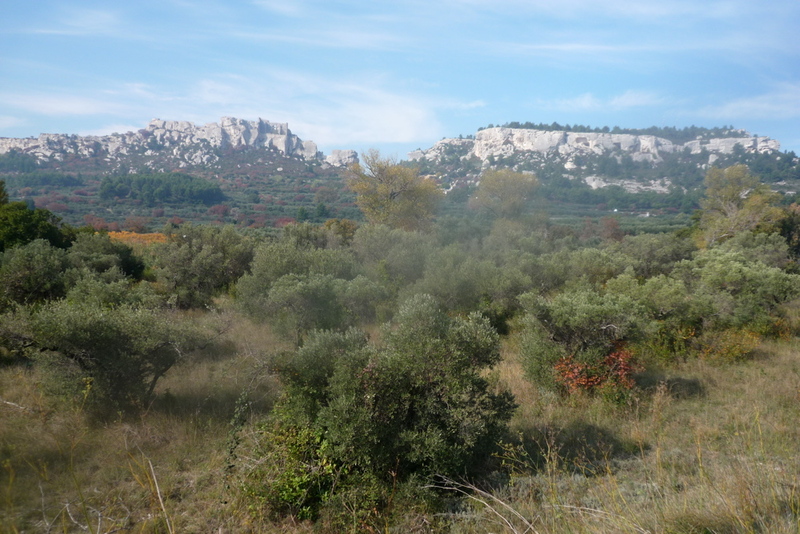 From here we turned back north and rode up to Les Baux de Provence where, if this had been two months earlier, would be filled to the turrets with tourists. It’s times like these I really appreciate that I live in the south of France. I’ve got this all year round, if I want it. Here it is from the south side going up. And the east side after going down. Even with the fog it was a great ride in an area I really have to get over to more often. Anyone have a used car they want to unload..? 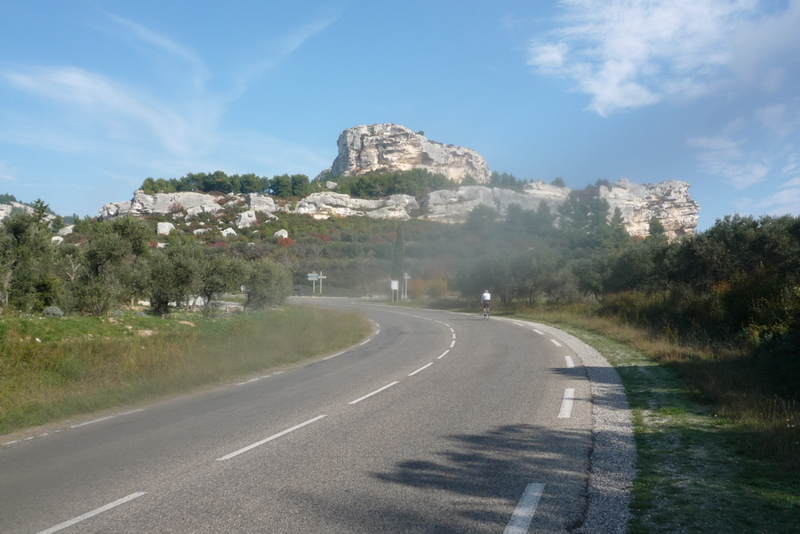 This entry was posted in Cycling and tagged cycling the alpilles, les baux de provence cycle route. Bookmark the permalink. 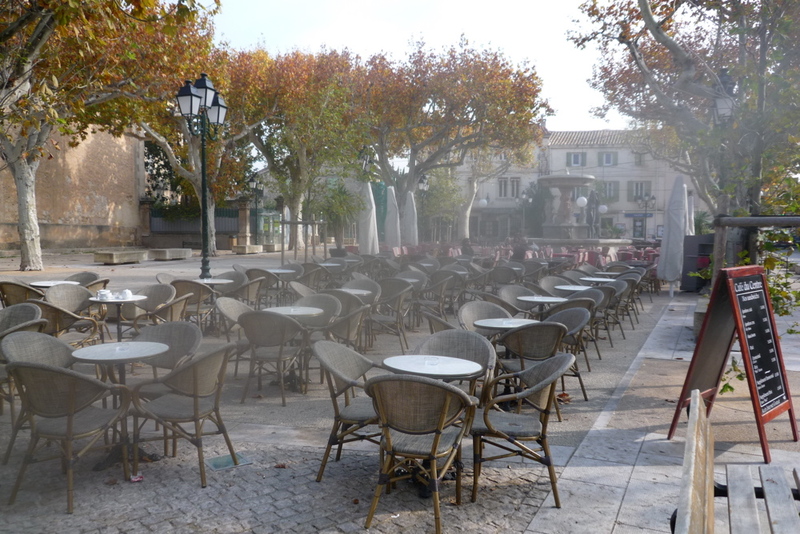 a question about the photos of village of Maussane.. there is a fog on the lens.. as well as on the mountain shot from the east and south….please check your lens just in case…. I knew someone would find that! I cleaned the lens later, so hopefully that’s the last of the foggy photos.